Size mattered, as it was forseen before this series began. The Los Angeles Clippers had the advantage in the paint, manifested in a huge fourth quarter from Blake Griffin and DeAndre Jordan, leading their team to a 126-121 win over the Golden State Warriors in game 7, moving on to the conference semifinals. The Warriors started out hot and defended very well as well, as the combination of Draymond Green and Andre Iguodala in the same lineup did a lot of good for a long time. Stephen Curry was making shots and getting to the line, while the Clippers ran into too many contested shots which went horribly for them in the first half until something changed in the next 24 minutes, as the ball suddenly started getting the right bounce. It wasn’t just luck. Chris Paul made life more difficult for Stephen Curry and was there with a big play whenever the Warriors began some sort of frightening run. Paul scored 22 points to go with 14 assists and 4 steals, putting on the kind of game you expect from a team-MVP to have with the season on the line. He didn’t really stop Curry, but he made it difficult enough for the sharpshooter, especially in the late stages of the game. Dryamond Green did a great job once again in the lineup, especially on offense. He knocked down five 3-pointers, finishing with 24 points. But even with Green once again playing bigger than he really is, it wasn’t enough. Blake Griffin, as always in Clippers wins, had a big night with 24 points and 6 assists, while DeAndre Jordan finished with 15 points, 18 rebounds and 3 blocks, including a huge one on Stephen Curry that might have swung the game finally in the Clippers’ favor during the fourth quarter. Finally the size and height came into play. 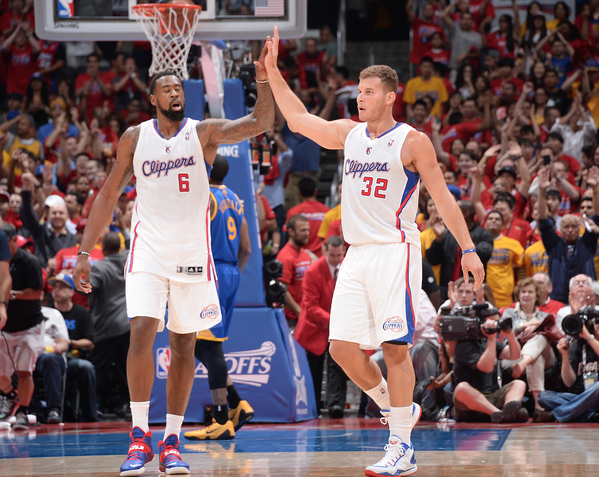 The Clippers were outscored by the Warriors in the paint through the first six games by 11.3 points a night. This time, it ended in a 62-38 advantage for the Clippers, who shot 55.4% from the field and got plenty of easy scoring opportunities in the second half, which included 21 points on the fast break and 24 points off turnovers, helped by 14 steals. The jump shots, even with a hand in the face, started dropping. The Clippers had only 9 points on 3-of-16 from the field on such shots in the first half, going into the locker room with a 8 point deficit to chase. They made 10-of-22 such shots in the second half, including 10 points from J.J. Redick who finished the game with 20 points. Jamal Crawford had 22 points to lead the bench scoring for the Clippers after a very up & down series for that unit. I’m not sure the better team actually won, but there’s no time for what if’s and trying to calculate how much the Donald Sterling scandal changed the outcome of this series for better or worse if you’re the Clippers. This franchise is in a time period that’s rare for them – reaching conference semifinals doesn’t happen all that often (Second time in three years, only third time since moving to LA), and with another heated rivalry waiting for them (Thunder), there’s not too much time to rest and smell the roses of victory.